We’d love your help. Let us know what’s wrong with this preview of HomeBaking by Jeffrey Alford. Home baking may be a humble art, but its roots are deeply planted. On an island in Sweden a grandmother teaches her granddaughter how to make slagbrot, a velvety rye bread, just as she was taught to make it by her grandmother many years before. In Portugal, village women meet once each week to bake at a community oven; while the large stone oven heats up, children come run Home baking may be a humble art, but its roots are deeply planted. On an island in Sweden a grandmother teaches her granddaughter how to make slagbrot, a velvety rye bread, just as she was taught to make it by her grandmother many years before. In Portugal, village women meet once each week to bake at a community oven; while the large stone oven heats up, children come running for sweet, sugary flatbreads made specially for them. In Toronto, Naomi makes her grandmother's recipe for treacle tart and Jeffrey makes the truck-stop cinnamon buns he and his father loved. From savory pies to sweet buns, from crusty loaves to birthday cake, from old-world apple pie to peanut cookies to custard tarts, these recipes capture the age-old rhythm of turning simple ingredients into something wonderful to eat. HomeBaking rekindles the simple pleasure of working with your hands to feed your family. And it ratchets down the competitive demands we place on ourselves as home cooks. Because in striving for professional results we lose touch with the pleasures of the process, with the homey and imperfect, with the satisfaction of knowing that you can, as a matter of course, prepare something lovely and delicious, and always have a full cookie jar or some homemade cake on hand to offer. Jeffrey Alford and Naomi Duguid collected the recipes in HomeBaking at their source, from farmhouse kitchens in northern France to bazaars in Fez. They traveled tens of thousands of miles, to six continents, in search of everyday gems such as Taipei Coconut Buns, Welsh Cakes, Moroccan Biscotti, and Tibetan Overnight Skillet Breads. They tasted, interpreted, photographed and captured not just the recipes, but the people who made them as well. Then they took these spot-on flavors of far away and put them side by side with cherished recipes from friends and family closer to home. The result is a collection of treasures: cherry strudel from Hungary, stollen from Germany, bread pudding from Vietnam, anise crackers from Barcelona. 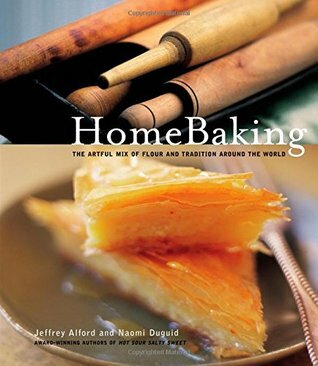 More than two hundred recipes that resonate with the joys and flavors of everyday baking at home and around the world. Inexperienced home bakers can confidently pass through the kitchen doors armed with Naomi and Jeffrey's calming and easy-to-follow recipes. A relaxed, easy-handed approach to baking is, they insist, as much a part of home baking traditions as are the recipes themselves. In fact it's often the last-minute recipes—semonlina crackers, a free-form fruit galette, or a banana-coconut loaf—that offer the most unexpected delights. Although many of the sweets and savories included here are the products of age-old oral traditions, the recipes themselves have been carefully developed and tested, designed for the home baker in a home kitchen. To ask other readers questions about HomeBaking, please sign up. Masterfully crafted & simple recipes from around the world that creatively use flour. From pies, cakes, cookies & breads - not only are the recipes easy to master, but the history makes each one richer in taste. This included one of the best recipes for challah I have ever used, and several mouth-watering treats using phyllo. I read about this book in the New Yorker. I'm excited to check it out.... Just got this book from the library. It looks amazing. The narratives and photographs make it the kind of cookbook I can settle in on the couch with before bed. Looking forward to trying out a few recipes this weekend. Apparently, I read this book by Naomi Duguid and Jeffery Alford in 2010. And yet, only six years later, I have no recollection of it, which is surprising. Because the photos are spectacular and there are lovely vignettes to accompany the many wonderful looking recipes. This cookbook really is wonderful. I particularly liked the parts about visiting the village oven in a small community in Portugal and a bakery in Kabul. The place [in Kabul] I remember most was the local bakery. Most of the time, it looked only like wooden scaffolding abandoned in an empty lot, but then several times each day the bakers would assemble. They'd fire the enormous vertical clay tandoor oven with juniper, the local abundant wood, making the neighborhood smell heavenly. Sometimes the recipes gave us pause though. The cinnamon rolls call for a whopping 13 c flour. This is in a book entitled "HomeBaking". Who makes that many cinnamon buns? The coconut bun recipe calls for zero eggs - that can't be right for "soft white filled buns"! And yet their bagel recipe does call for egg. Really???! Since when does bagel dough ever contain eggs? But the ideas, photos and descriptions make up for any slight strangeness in the ingredients lists or instructions. The lovely memoirs of the cinnamon rolls and dog races with Jeffrey Alford's dad, and of Naomi Duguid's grandmum, who lived to be 107 and when she was old, "the thing she enjoyed most was the freedom not to have to cook". In around 1920, she came from England to live in a one-room log cabin the Northern wilds of BC - no electricity or running water, no telephone. She did "all the cooking, all the washing up and laundry, and Grandad still cut and hauled firewood in winter, then split and stacked it. And they still carried all their water up from the creek." It wasn't until she was widowed in her mid-eighties that she moved to the city to live in her "own small house for many years, eating toast and prunes for breakfast and avoiding the stove as much as possible". I love all the authors' cookbooks. So beautiful, with authentic recipes, wonderful stories and beautiful photographs. I love the way all the books have a theme but still weave in accents and additions, like including a recipe for Seville marmalade in here. The flatbreads and rice books are my favourites - I'm not much of a baker, though I like to make bread - but all the books are very, very good and worth owning. My husband gave me this cookbook for Chanukkah last year...what's great about it, other than the fabulous recipes, is that it includes the history of baking...the types of baking as well as individual recipes...in a narrative style. Well worth the read as a non-fic book as well as a great recipe book for breads. A cookbook that was a hard to put down read. I found myself drifting through every page and reading the stories of the recipes as well as the stories in between. The pictures reminded me of a National Geographic expedition. There are a couple of recipes I'll probably try. a unique set of recipes drawing from baking traditions all around the world. my successful attempts include ukrainian honey cake, gingerbread w/ molasses, and brownies. coriander cookies were a little too strange for my tastes, but i like the fact that the recipe is from the 1900s. This is the kind of cookbook that inspires me, like everybody's grandmother is cooking for you. Pieces of love & life baked into deliciousness & served with their stories so you can, for a few bites, become part of their traditions, their families. Like Alford and Druid's other books, this one is part cookbook and part travelogue. The recipes are interesting and represent the best baking of the regions covered. Beautiful visually and wordwise. And the recipes can make you drool. If you're at all into baking, pick up a copy of this book. 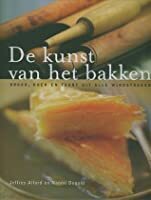 A beautiful book by husband and wife world traveler bakers, stories of place and food of the "people" great pictures and great recipes too. Some great recipes for bread in here. Got this for $2 at a thrift store. Have been using the bread recipes in here weekly for the past 6 months!